Trump nearly started a war with North Korea when he drafted a series of “almost unthinkable” tweets ordering the evacuation of Americans from South Korea – indicating an American first strike. The tweet “scared the daylights” out of his defence secretary James Mattis, a new book claimed. Mattis begged the President to reconsider and it was eventually pulled before it was ever sent. The US President wrote tweets setting out his vision of the conflict between North Korea and the US, according to an upcoming book by Bob Woodward. 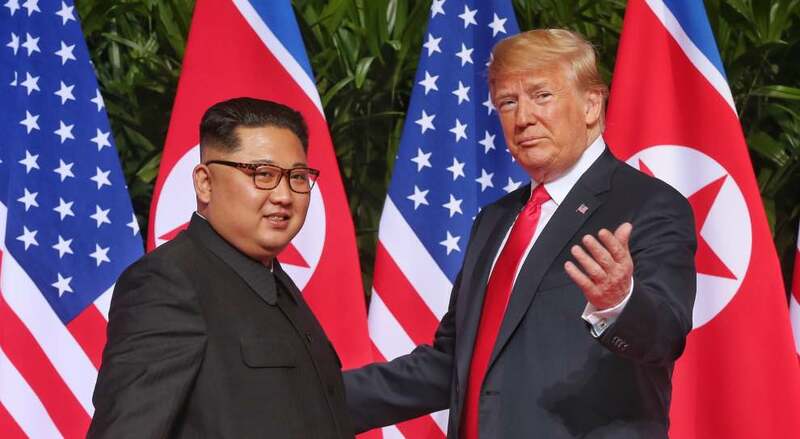 At the peak of the tensions between the Washington and Pyongyang in early 2018, Mr Trump had prepared a tweet arguing the two countries’ tensions would ultimately become a two-man clash, according to Watergate journalist Mr Woodward. In his book, Fear, Mr Woodward reported the tweet saying: “This is all about leader versus leader. Mr Woodward also claimed the US President wanted to send a tweet ordering thousands of family members of the 28,500 troops currently in South Korea to leave the country. This announcement would have been interpreted by North Korea as a declaration of war, as it had been previously explained to the US President’s national security staff by a senior figure in the North Korean Communist Party’s executive committee. Mr Mattis and his staff urged Mr Trump to reconsider sending his tweet, as it could have led Kim to attack South Korea, and they eventually succeeded, Mr Woodward wrote. But the president raised again the idea of evacuating South Korea with Lindsey Graham, the Republican senator with whom he plays golf, hoping to receive more support. But his proposal was once again shunned. Mr Graham is believed to have told him: “That is a big frigging deal. The US President has often convened official messages via his favourite social media platform, Twitter, where his account counts 54.3million followers. And he directly addressed Kim more than once before their historical meeting earlier this year. In September 2017, Mr Trump called the North Korean dictator “a madman who doesn’t mind starving or killing his people”. Mr Woodward’s book makes other explosive claims, including Mr Trump’s desire to assassinate Syria’s President Bashar al-Assad. According to the book to be released on September 11, the US President furiously shared with Mr Mattis his desire to attack Mr Assad. The claims made by Mr Woodward have been denied by the US President, who took to Twitter to deliver his attack to the journalist. He wrote: Mr Trump said on Twitter: “Isn’t it a shame that someone can write an article or book, totally make up stories and form a picture of a person that is literally the exact opposite of the fact, and get away with it without retribution or cost.